The truck is losing a gallon of water a day. We make sure we have lots of water for now. We fill tanks before the Mexico border. Oh Yeah! We score a nice California motel close to the border crossing, and there is a shaded area to work on the bikes, hard to beat that. I picked number 2, I was one of the first to register and I was so excited. 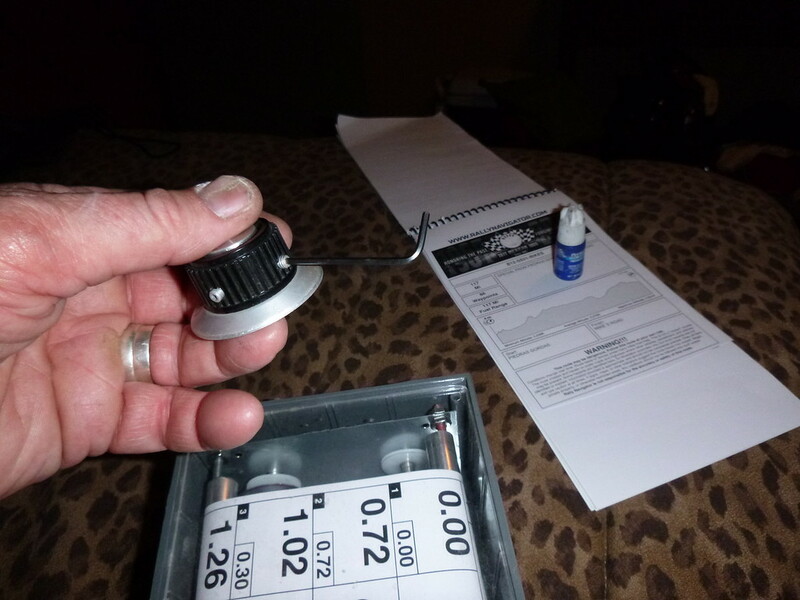 Tom has his tools to Tune the spokes and is fired up to dial theme in. Every other spoke Tom complains how loose they are. "They should have done this when they changed your tire!" and "You are the person most concerned with your bike"
Tom thinks the break cables needs rerouting. He is right. He cranks on the suspension to make sure it can endure the entire Baja race. !!! Part of some training I went through a few years ago taught us to share our dreams and successes with others. This is why I sending this email. 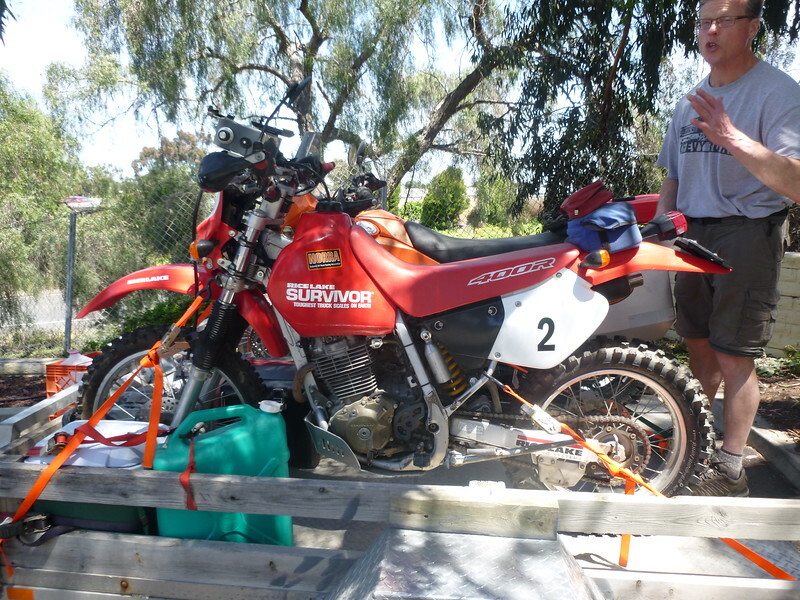 The Dream: Starting at age 11 I have been dreaming of off-road racing in Baja Mexico. 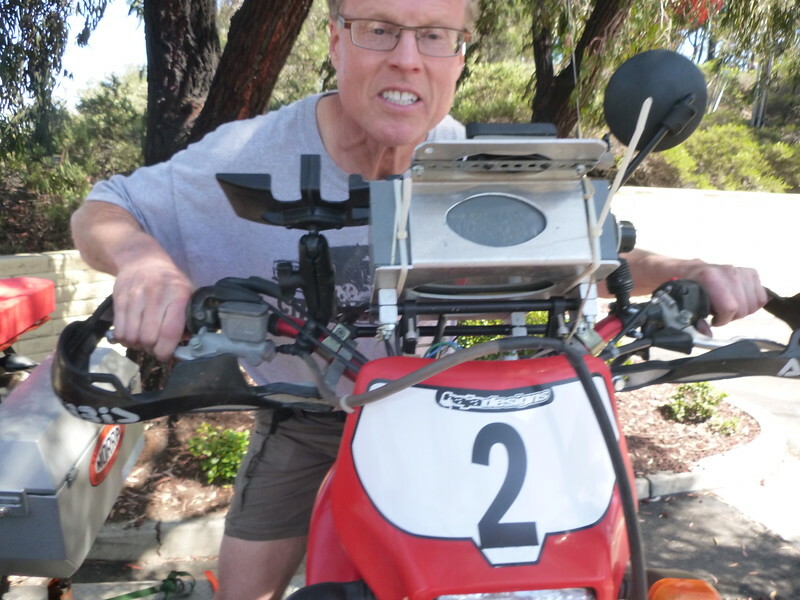 For the past 48 years, every time I go off-road or just hit rough terrain the word “Baja” comes out of my mouth. 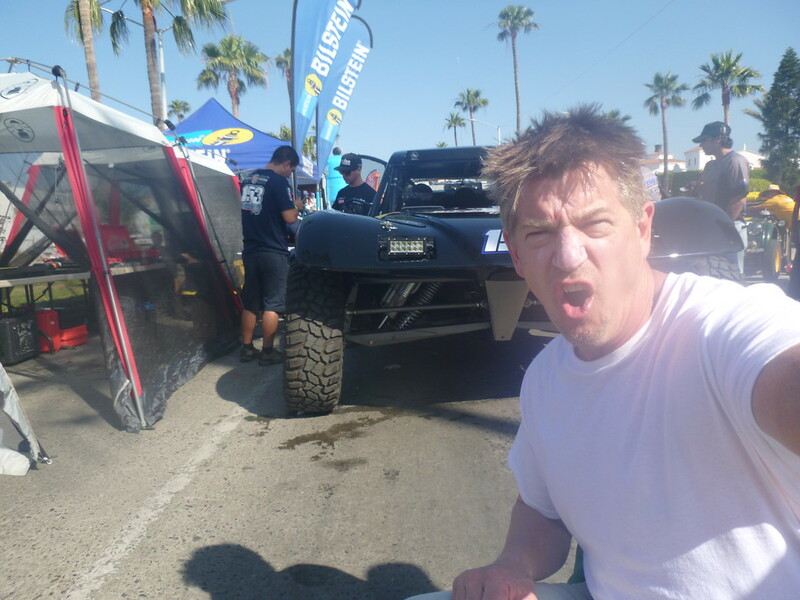 The Realization: Last year while in Baja Mexico my wife and I watched the Mexican 1000 race. While getting extremely emotional I turn to Heidi and say “I have always wanted to race Baja” She turns to me and immediately responds with “You should do it!” From that moment in time my life completely changed. 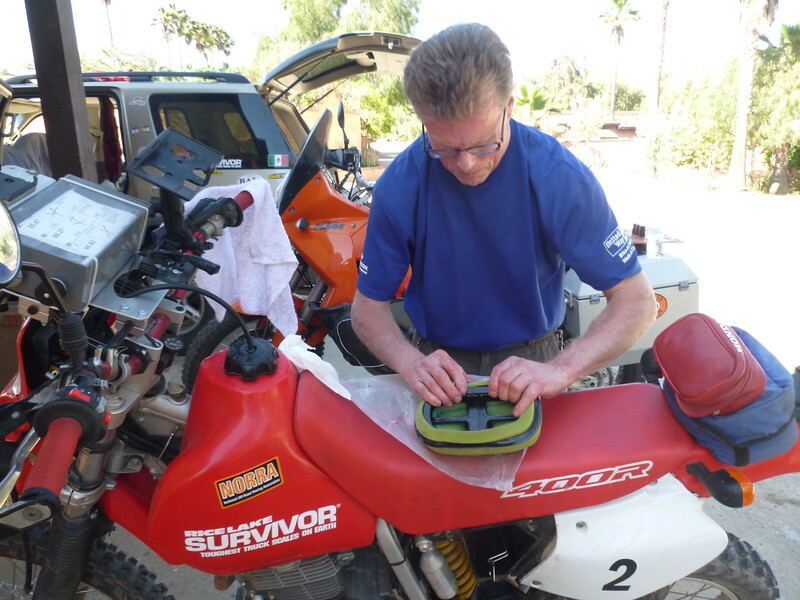 For the past 351 days, I have been preparing myself and my motorcycle to off-road race 1,300 miles through some of the roughest terrain on earth. I never knew I was capable of pulling something like this off until my wife suggested I try it. The lesson I learned here is that you never know what you are capable of doing or becoming until you try it. 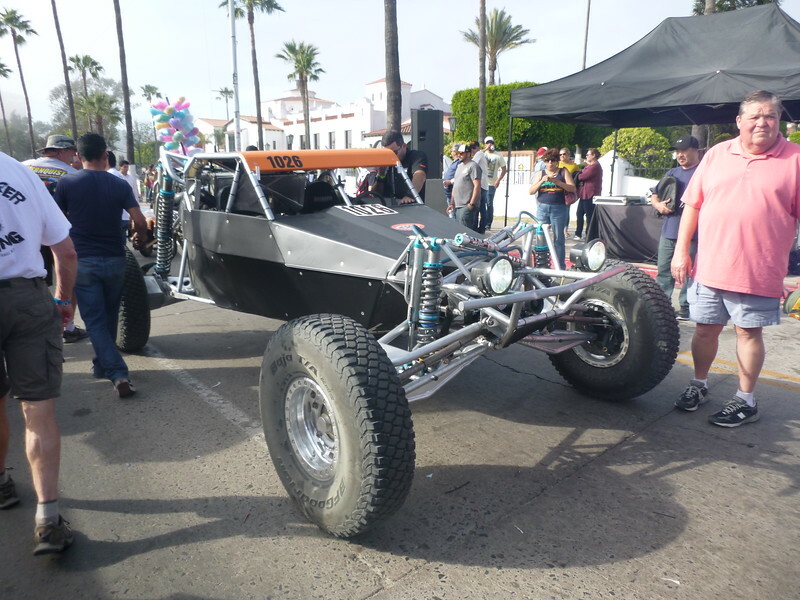 The Race: The NORRA Mexican 1000. 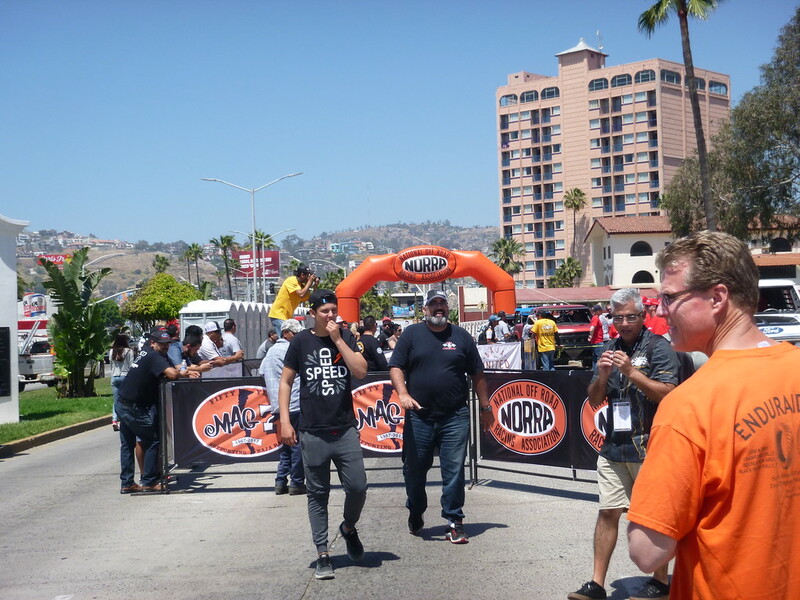 This is the 50th anniversary of off-road racing and NORRA is the organization that started it all back in 1967. 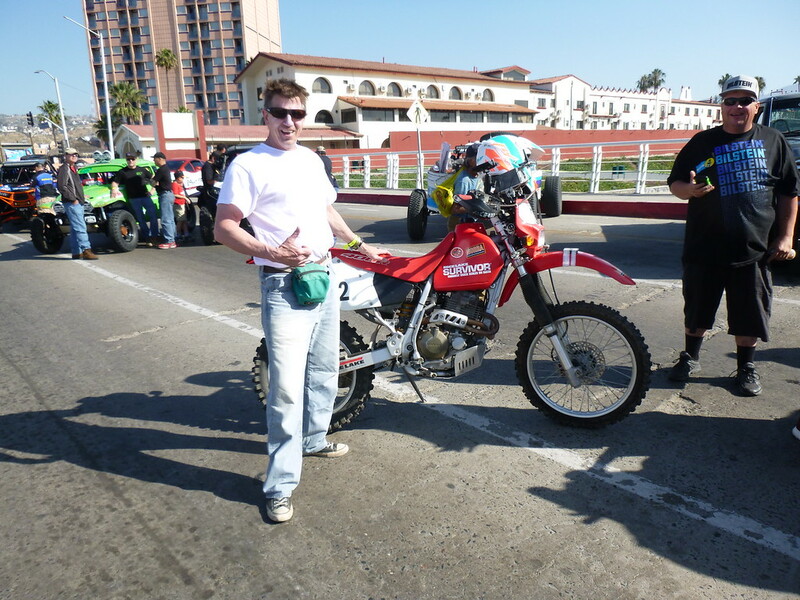 It was first televised on Wild World of Sports the following year, that’s when the word “Baja” became part of my DNA. 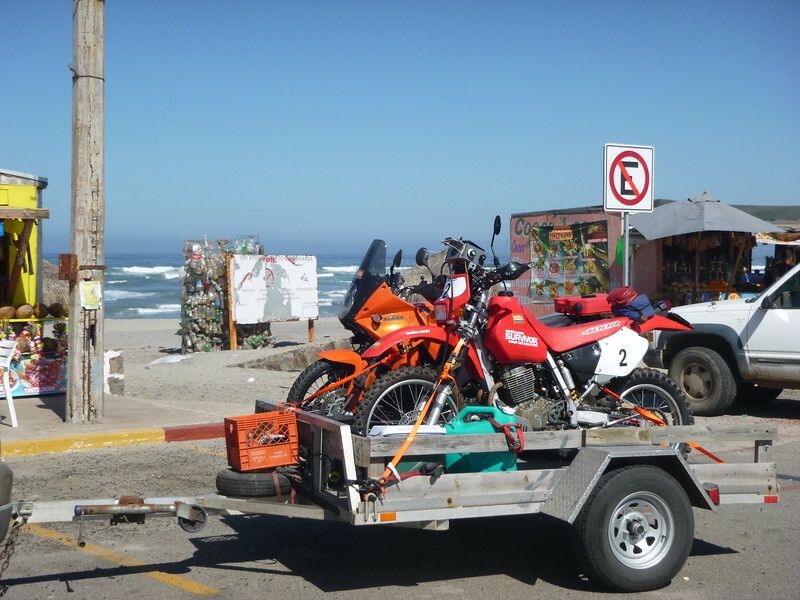 Entry into Mexico went smooth, even though we went through the passenger car crossing, lucky for the small trailer. Horsepower Ranch, at the 9KM marker just like BajaBoundMoto said, perfect! We got the best room, maybe because I booked minutes after registration opened, I think I was the first. That filter did not want to snug onto the frame. Tommy finally stretches it on. It's great watching all the 4-wheelers tool in. Hipster loves asking technical questions about these machines. 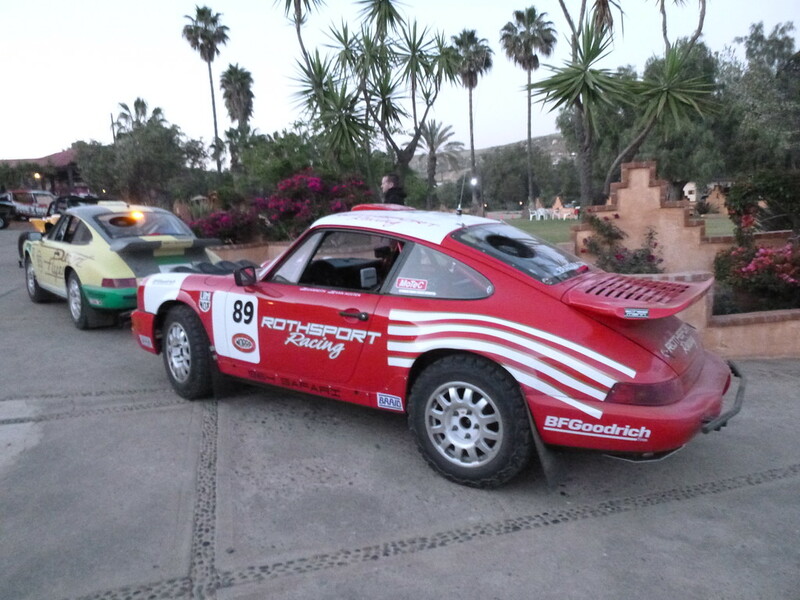 The Porsche 911's decked out for off-roading, nothing cooler. Having an extra day to accumulate was smart, racing is high energy and we need to take care of business so we can cool down, think hydrate, eat and plan. We are the only bikers at the Horsepower, and Tommy is my support crew chasing on his bike. 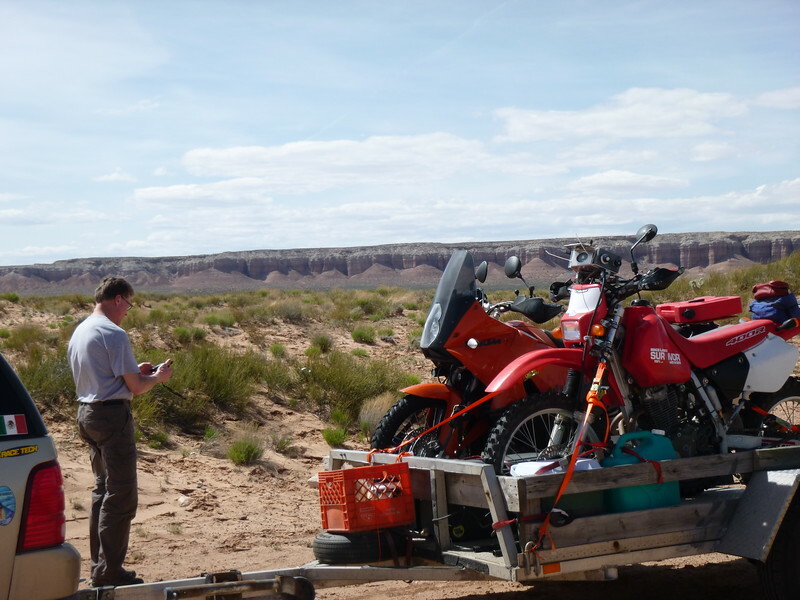 All good, there is no elevation about anything not covered in our plan, it just has to go smooth through registration and the loading of the GPS files on our Garmin GPSs. 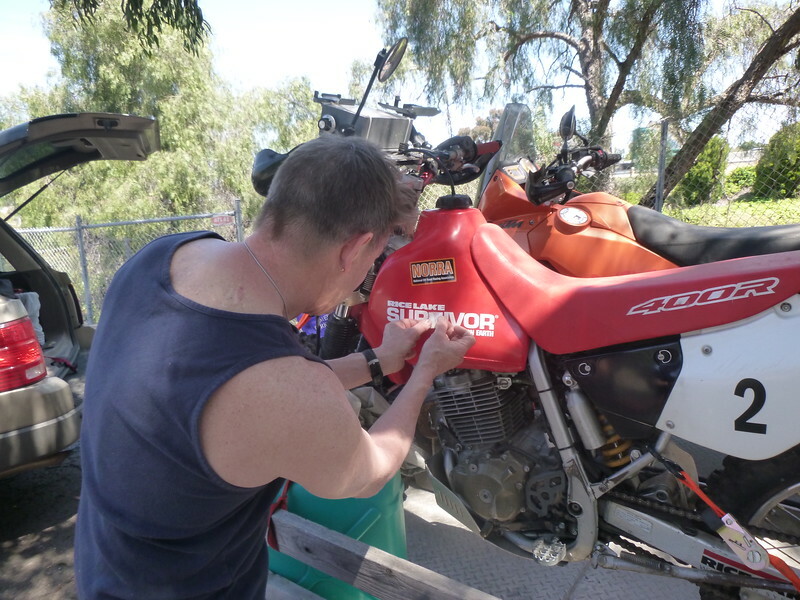 We immediately connect resourced and try to figure out technical stuff together. Hipster was all over the GPS files which I could not load with my cheesy laptop. Everyone was helping, DJ and his team were teaming with us also working with Hipster trying to get all our GPS files loaded onto everyone's GPS. This is my first GPS and the main guys at registration said I don't have the correct GPS for the course files. But Hipster and everyone else should have no problems. I don't care, my $125 GPS's screen is so poor I never had been able to see it while riding. My plan is to just pack it in case I get lost, which won't happen. OK, we are full on now. All morning was spent going through all our stuff and separating what will go in the Mag-7 tote box that will follow me to every stage, what I need to carry with me in my backpack during the race, what Hipster will carry for me on his bike and supplies I will need now while staging for the race start. I took out a lot of stuff I’m sure I will not need or use, I always over pack. I am completely jacked up inside while sifting through everything. I try hard to relax, that’s why I’m writing this now. We feel like we have everything under control but still the jitters inside. 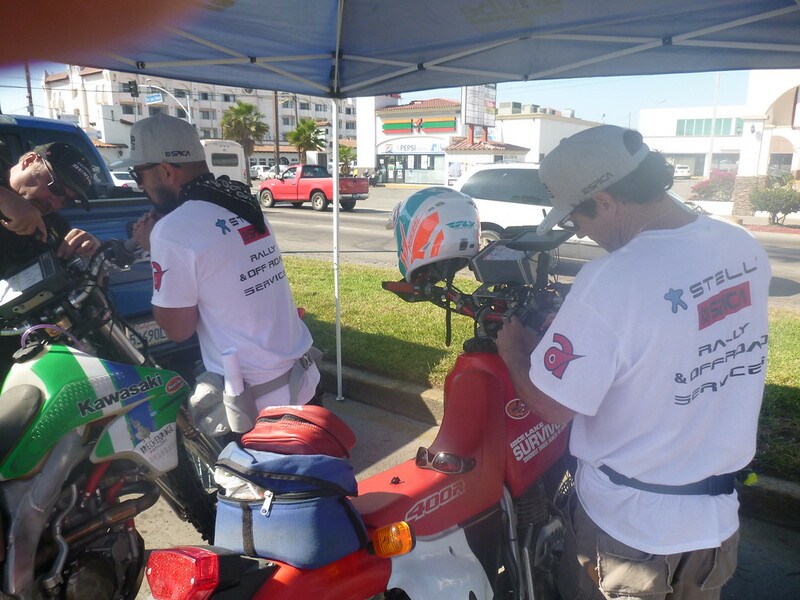 We are getting ready to head into Ensenada for registration and Stella race box training. There is also a 2 hour first aid course we are also going to attend today. We need to pick up a few supplies in town also, like smaller bottles to fit my air filter oil and such. We don’t know exactly how big the Mag-t tote boxes are, we just hope it is big enough to fit my late Father’s WW-2 army duffle bag holding my tent, sleeping bag, bed roll, food, cloths and bike stuff, oil, filters, sprocket etc. I got it as small as I could. Today we will also try to hook up with FirePig’s team so we can hand off a rear tire for them to carry and to rally with his team. We are also going to try and hook up others inmates. After we do all that today we will come back to our bikes and ride them into town for the race tech inspection. After that we just need to attend some racebook training and just the general race meetings. Sunday we are up at 4:30 AM to be to the starting area before 6. Ouch it will be colder then expected, so I will dress warmer then anticipated. My plan will be to strip off one top layer before the race start, and maybe a second layer during the race if it gets hot. My backpack is going to be fuller then I want but that’s what I got to do, I should have everything I need either with me or following me to the stage areas. Again thanks everyone for all the well wishes and great words of advice. The goal: Finish this freaking race. Left to right: Brian, Loren , Dave , Jeff. All top notch dudes. Discussions are technical. FirePig's team is intense, everyone has a role and is focused on the job. It helps bring me down to neutral, listening to them strategize. Racer's meeting day before the start. 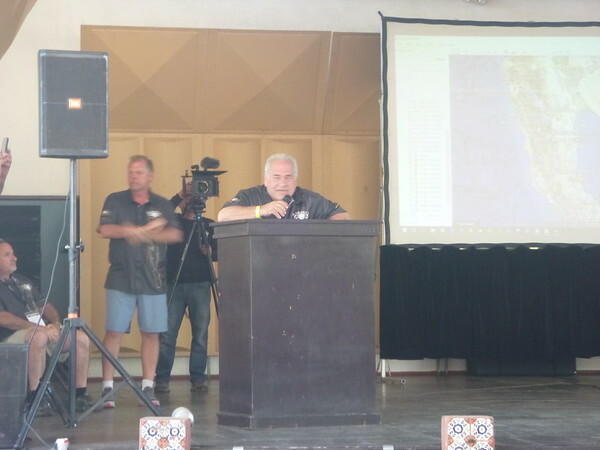 The biggest off-road racer meeting ever. 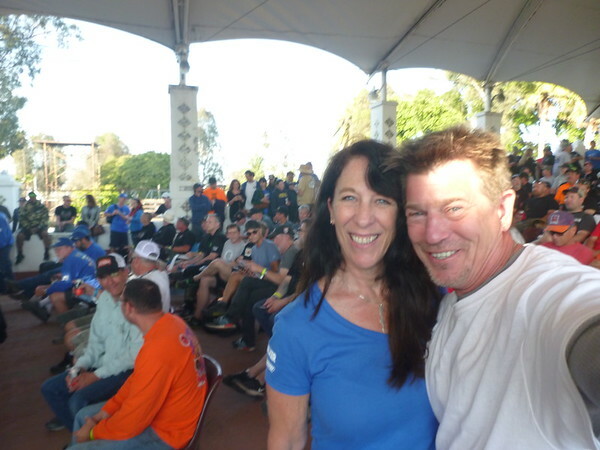 I jumped at the chance to meet THE icon of Off-Road racing, Betsy Anderson. 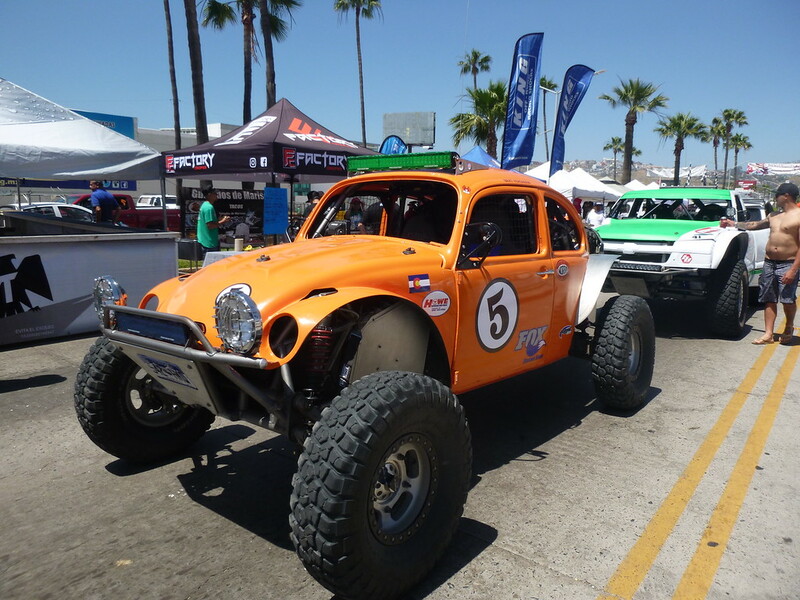 She starts all the NORRA races. The excitement is reaching a boil. No epic speeches but it got the juices flowing all the same... 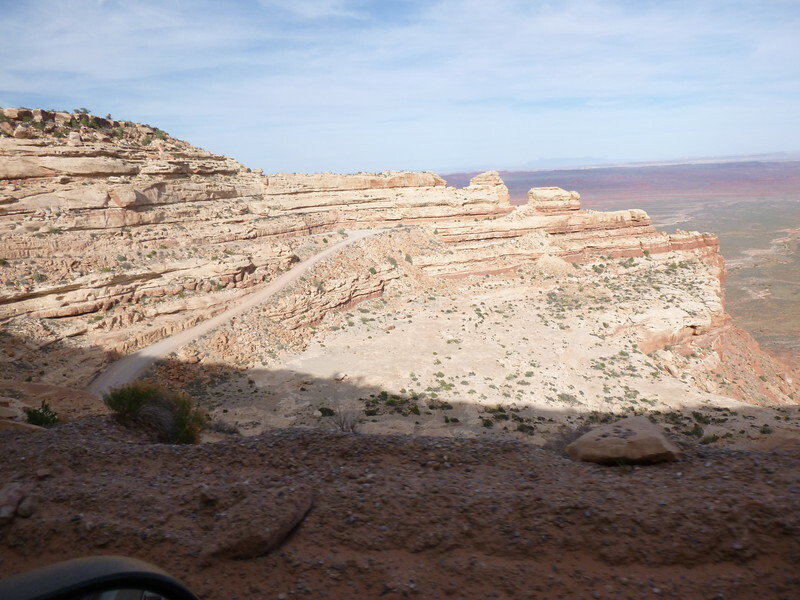 This is how off-road racing started and this is how it is today. I am so fortunate to be a part of the 50th anniversary,I cannot believe this. Back at the HP Ranch we do our final prepping, separating and packing everything we will need during the race and at the end of each section. I decide to mark and tape up all the Race Book scrolls for each day ahead of time. It’s a big process and I don’t think I will be wanting to do it in my tent after racing all day. 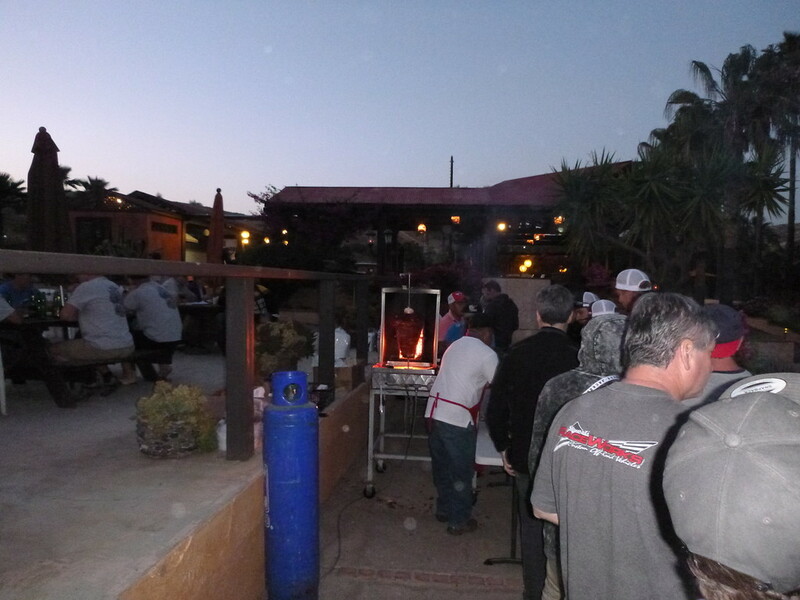 There is another outside barbeque at the Horsepower Ranch, it’s fun talking with different tables of racers and finding out what they are driving. 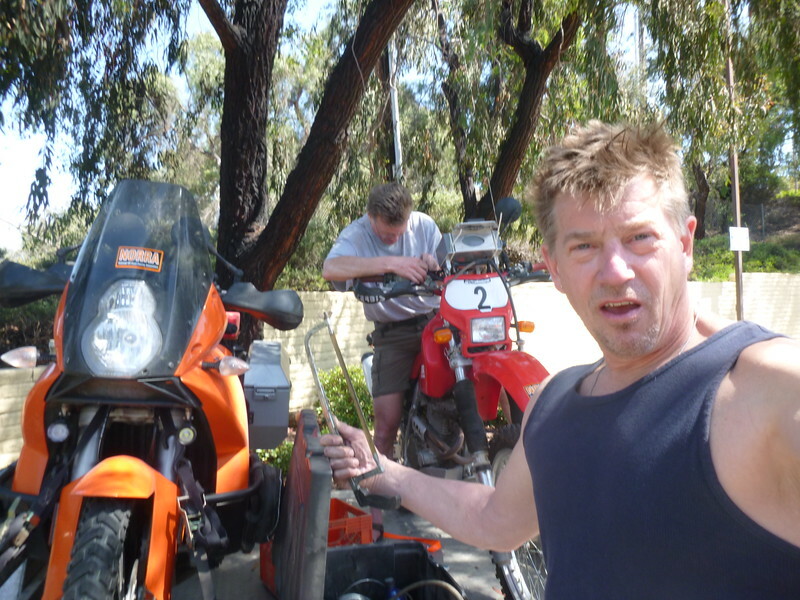 Its funny how everyone remembers us from the first night, like we are the crazy moto dudes. Everyone wants to know how we are doing. 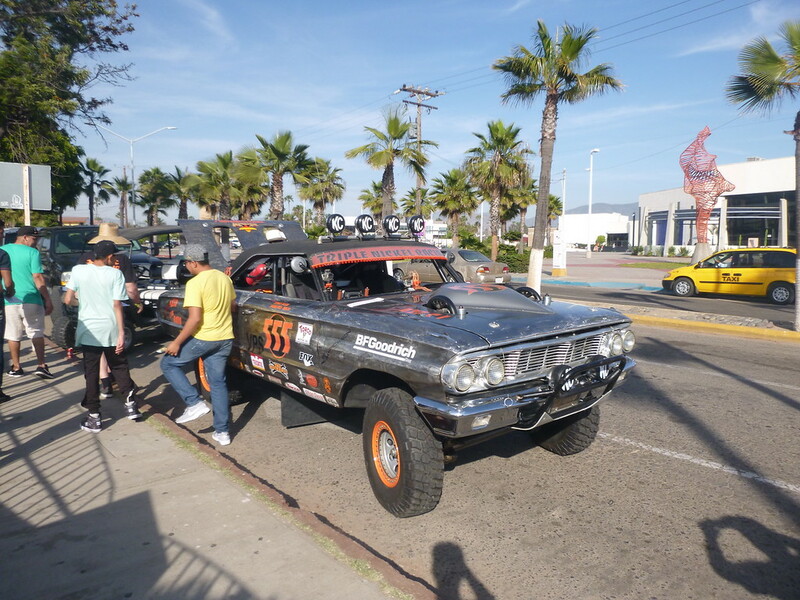 Ensenada: In line for tech inspection.